The Dominican priory also known as St Mary's Priory is beautifully situated down a grassy slope to a site along Lough Arrow. 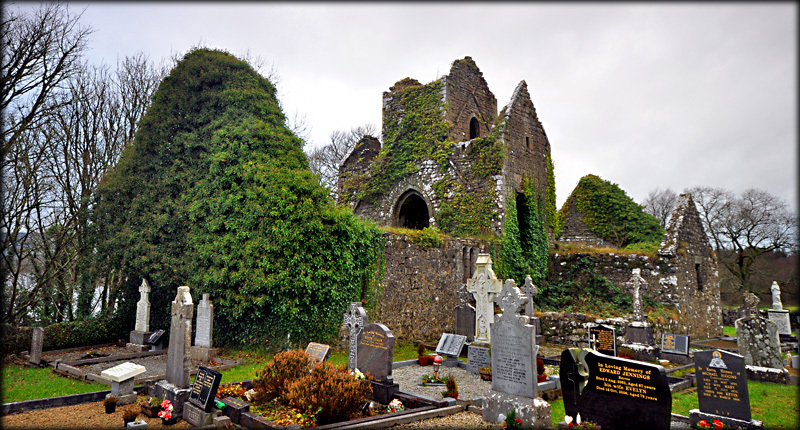 Founded in 1507 by Thomas O'Farrell under the patronage of the MacDonoghs, the remains consist of a Middle English Gothic style church with a nave, a chancel, a central square bell tower and a later transcept. 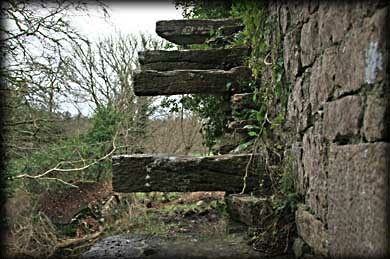 We were amazed that the priory is on a narrow ledge with a steep drop to the banks of Lough Arrow on its south wall, and that to get to the upper level of the central screen requires navigating steep stone steps set into the stonework of the church walls outside the south-facing chancel door. The interior is stunning with an unusual triple vaulted archway on two levels in the center of the church. At ground floor level there are three compartments, the central one linking the nave to the chancel. In the roof of this central arch as well the arch above it are two bell rope holes which once lead to the tower bells. The compartment to the left holds a gravestone while the compartment to the right has been blocked by a wall. The second story rooms (reachable only by the outside stairs previously described) may have been the priest's residence. The priory and its lands were confiscated after Henry VIII's Suppression of the Monasteries. Situated: Heading towards Sligo on the N$. Turn left at Castlebaldwin. Following the signs for Cromlech lodge. Turn right at Heapstown crossroads. Then right again at the next crossroads. The abbey is down here on your right. Discovery Map 25: G 7884 1491. Last visit Dec 2011.